It was terrific to be back in North Ringwood colours on Sunday as we took on rivals East Ringwood in the traditional Sunday Round 1 game. It is always a crucial game to start the season. We had a new look side with only one player above the age of 28 and 10 of the 22 new to North Ringwood in 2018. The conditions were warm and blustery. Our first 15 minutes wasn’t great. A little fumbly and some crude tackles. Our intent was good but I suspect over anxious and nervous. We did settle in the second half of the quarter though. A terrific Jones spoil and goal, a Hoegel goal after terrific work up the field from Sheppard and Anthony Sharp and Marcus Joyner hitting the scoreboard were among the highlights. Culljnan started very well in the ruck in his first game with the club with 4-5 first quarter marks and Whelan winning a truckload of the ball we went to 1/4 time with an 11 point lead. The second quarter was a bit of an arm wrestle with both teams unable to use the ball effectively enough going forward. We didn’t kick a goal for the quarter- one where we had 16 inside 50s for 6 behinds. We maintained a slender lead at half time. In the third a couple of terrific goals to Jones and another full length transition that ended with Hoegel had us on top but again our last possession inside 50 was seeing us waste opportunities and not ending the contest. The ball had continued to be very ‘hot’ around the contest with both sides tackling well and pressuring the ball carrier but our composure to complete our good work up the field has to improve. The last quarter was a slog. Both sides were fatiguing in the hot conditions. A great left foot captain’s goal from Jack Whelan and a long set shot from Jones for his 4th of the day put an exclamation mark on both their great individual performances. I think both sides would say that the ball use could improve but it was a very competitive contest so to get a hard fought win with so many new faces and a side that is still learning to play together was a positive start to the year. 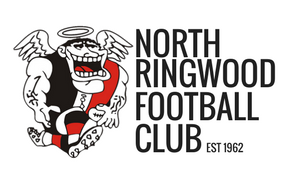 We hope to see heaps of the North Ringwood faithful at Quambee this week as we take on Knox. Best Players: J. Whelan, T. Jones, M. Joyner, M. Cullinan, J. Petracca, G. Phelps, A.Sharp, M.Sheppard, M.Locco. Welcome back to the 2018 season to all sponsors, supporters, committee and players. of u/19s from last season, which has brought a good energy to the group. Congratulations to Jake Hollingworth who played his first game for the club after joining us from Chirnside Park. Vice Captains Josh Taratuta and Jordan Ursich. up forward, with big Kaka and Jordy being strong target points. to hit the best targets. midfield and wing and gave us real strength at winning the footy first. be critical to ensure we consolidate to maintain the tempo and control. first touch and Darcy Harris having a cracker of a 5-minute patch kicking 2 goals. By the end of the 3rd , we had a strong lead – but wanted to finish off the game strong. the game – however this is a really good learning for the future as we spoke about. Marshall was able to keep his opponent goal-less as well whilst getting his share of the footy. several of the boys after a couple of tough years. keep working and getting to training and strive to get better, and ensure on the weekend we are all giving our absolute best. Each week is going to be very tough with good opposition, and we must be right to go. Rouget (ERFC) *Seniors, Liam Taylor (Park Orchards) *Seniors. they also had 38 players to choose from including around 14 TAC Cup listed players. cup players available for this game, so we were up against it from the start. that the effort of our boys was super. forward entries on most occasions. degree weather is not ideal and we ran out of the legs. As a team we learn a little from this game and quickly move on to our next opposition Knox. Live music in Clubrooms this Saturday night.